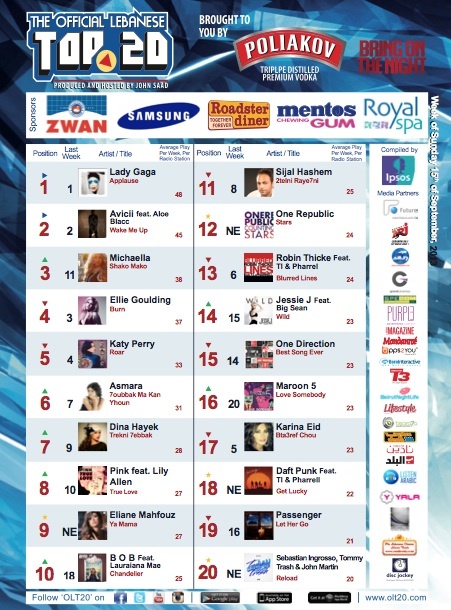 The relative calm of the last few weeks continues on “The Official Lebanese Top 20”. As last week we have a total of 4 New Entries today from which 2 are actually Re-Entries! It’s not much! So it’s business as usual until things change next week as expected. To start with it is worth noting that American singer Lady Gaga manages to hold on to the Number 1 spot for a massive 4th week in a row! Great achievement as well for Lebanese singer Michaela for entering the Top 3 with “Shako Mako”, and for Swedish DJ & producer Avicii featuring Aloe Blacc for staying at Number 2 for yet another week. From the 4 New Entries this week, we have “Ya Mama” at Number 9 from Lebanese singer Eliane Mahfouz, “Counting Stars” at Number 12 from American Pop / Rock band One Republic, “Get Lucky” at Number 18 from Daft Punk, and “Reload” at Number 20 from Swedish house producer Sebastian Ingrosso and Australian producer Tommy Trash. On OLT20 this week we have 6 Local and Regional artists, and 14 Occidental ones! Note that you can check out the latest videos from your favorite singers on the new TV show “Hits N Bits / OLT20” on Future TV every Friday evening around 11:00pm, and Sunday evening at around 7pm for the re-run.